Movie Review: The Coen Brothers’ Hail, Caesar! The Coen Brothers films are the reason why we go to the movies. And as such we are given an experience unlike any other. From the drama of a struggling musician in Inside Llewyn Davis to the issues of morality in No Country For Old Men to the dark comedy of Fargo, the Coens prove time and again that they are clearly ahead of the curve and are just the smartest men in the room. Their latest project, Hail, Caesar! is like a love letter to the Golden Age of Hollywood. Which is great, if it actually took the time to be something other than just a love letter to the Golden Age of Hollywood. While the film touts an incredible all-star cast playing roles of all sizes, it is probably too smart for its own good. 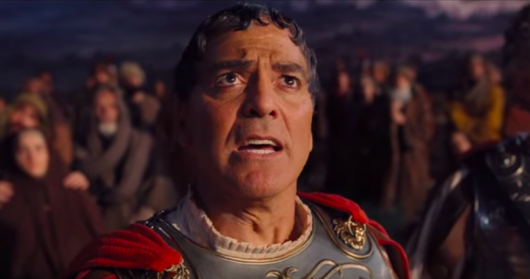 The Coen Brothers‘ long-gestating Hail, Caesar! is finally arriving into theaters this Friday. The film explores old Hollywood, an age where fixers are hired by major studios to keep actors out of trouble or clean up the trouble by handling the press. Eddie Mannix (Josh Brolin), a fixer for Capitol Studios, not only has to deal with impending scandals, but also has to find out where a kidnapped Baird Whitlock (George Clooney) is being held by a mysterious group called The Future. We were recently invited to sit down at the film’s press conference where Brolin, Clooney, Alden Ehrenreich, Channing Tatum, and Jonah Hill were on hand to talk about the film’s comedy, not improving a perfect Coen Brothers’ script, not making any suggestions to Roger Deakins, and more. Universal has released a new trailer for Hail, Caesar!, written and directed by Joel and Ethan Coen. Starring Josh Brolin, George Clooney, Alden Ehrenreich, Ralph Fiennes, Jonah Hill, Scarlett Johansson, Frances McDormand, Tilda Swinton, and Channing Tatum. Set in the latter years of Hollywood’s Golden Age, the film follows a fixer (Brolin) who gets tangled in a Hollywood scandal involving kidnapping an A-list movie star (Clooney), a huge ransom, and more. Check out the latest trailer for Hail, Caesar! below. It’s almost been three years since we last saw a Coen Brothers film, but come early next year we won’t have to wait any longer. Hail, Caesar! features an eclectic and all-star cast featuring Josh Brolin, George Clooney, Scarlett Johansson, Channing Tatum, Jonah Hill, Ralph Fiennes, Scarlett Johansson, Tilda Swinton, Alden Ehrenreich, and Frances McDormand. Now Universal has released the first trailer for the film. Set in the latter years of Hollywood’s Golden Age, the film follows a fixer (Brolin) who gets tangled in a Hollywood scandal involving kidnapping an A-list movie star (Clooney), a huge ransom, and more. Check out the first trailer for Hail, Caesar! here below. The Coen Brothers‘ films have always had a strong cast, but none as eclectic and powerful as Hail Caesar! The film already has cast a few Coen Brothers film alum members like George Clooney, Tilda Swinton, and Josh Brolin. The three will be joined by Channing Tatum and Ralph Fiennes. Now the film about Hollywood in the ’50s will be adding Scarlett Johansson and Jonah Hill. This will be a reunion of sorts for Johansson who has worked with the Coen Brothers once before in The Man Who Wasn’t There; as well as for Hill, who will reunite with 21 Jump Street co-star Tatum for a fourth time. Hit the jump to see what they will play. 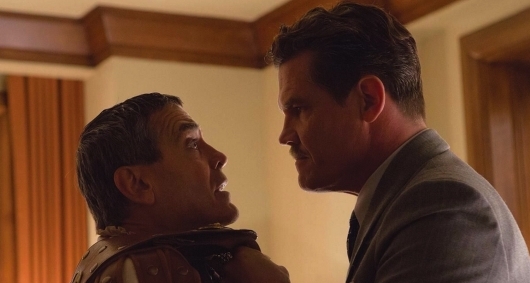 Josh Brolin and George Clooney have both been leading men in Joel and Ethan Coen films. 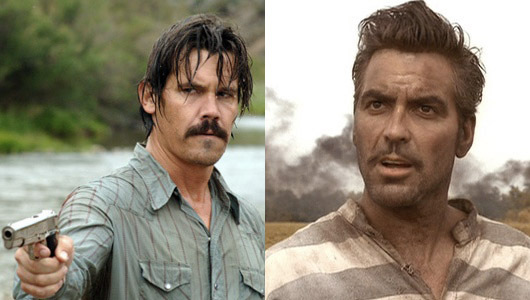 Clooney starred for the Coens in Intolerable Cruelty, O Brother Where Art Thou?, and Burn After Reading, while Brolin starred for them in No Country For Old Men and True Grit. However, the two haven’t appeared together in one of their films, until now. Hail, Caesar! 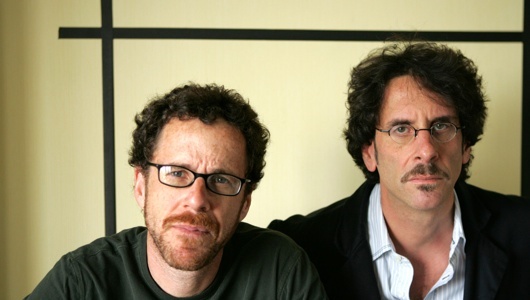 is the Coen Brothers’ upcoming project, and Brolin and Clooney have been cast as the two male leads.